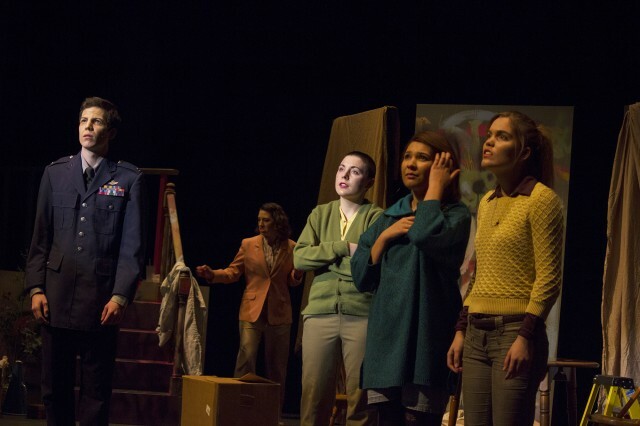 The Goshen College Theatre Department performed the plays “Stay Tuned” and “Do Not Gentle” for Winter One Acts at the Umble Center last Friday, Saturday and Sunday. “Stay Tuned” was written by 1999 GC alumnus Peter Eash-Scott. The play explored the impact of the external voices of our daily lives upon our relationships with others. Grace Swartzendruber, GC performance venue production manager, directed “Stay Tuned,” which featured Brett Conrad, a junior; Karsten Hess, a senior; Lea Ramer, a first-year; Nick Peebles, a first-year; and Adrienne Schmucker, a sophomore. 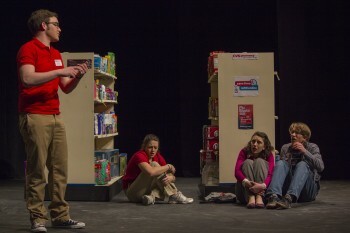 “Do Not Gentle,” originally written by Suzan Zeder, was directed by Angie Troyer, a senior, as her senior performance. Inspired by Dylan Thomas’s poem “Do Not Go Gentle Into That Dark Night,” the play featured Lillian Boedecker who realized, upon death, that she could not move ahead without mending the rifts manifest in her family relationships. The show featured Lauren Treiber, a senior; Brett Conrad, a junior; Ally Medellin, a first-year; Paul Zehr, a junior; and Schmucker.